Blurb: The sixtieth birthday party of Silas Kane was marred by argument and dissension amongst his family. And then, the morning after the celebrations, Kane is found dead at the foot of a cliff. The theory that Silas accidentally lost his way in the fog is confirmed when the coroner returns a verdict of death by misadventure. Review: I feel like Georgette Heyer is one of those authors that really isn’t as popular as she should be. Most of her books (of which there are about fifty five or so) are regency romances a la Jane Austen, twelve of them, however, are crime/mystery novels. I love murder mystery novels, I honestly do- so it’s no surprise to me that I adored this book. Characters play a massive role in mystery novels, as does the plot- you may think this is the same for every genre of book, but I believe the emphasis is put on these two aspects in mystery novels more than any other genre. The characters within ‘They Found Him Dead’ were all brilliantly constructed- there are of course the characters you are made to love, the ones you hate and the ones you just can’t seem to figure out. The plot was also brilliant- the actual summary of this book does absolutely no justice to the actual plot. There are so many twists and turns and little details that make you wonder who the murderer is and whether other people might be protecting them. One of my favourite things about mystery novels is trying to work out who the murderer is going to be, and I especially enjoy it when I pick the completely wrong person. I admit, the murderer was not who I thought it was, but that just made the book even more interesting for me. 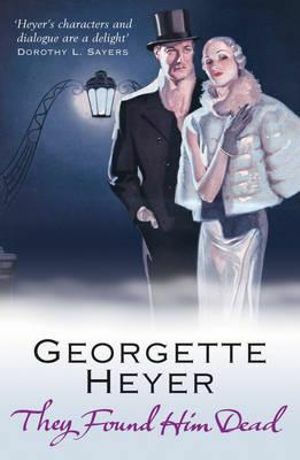 If you’re a big fan of Agatha Christie like me or if you just like mystery novels, you should definitely give Georgette Heyer a go. And if mystery aren’t your thing but romances are, I would definitely suggest checking out of her regency novels. Heyer is my favorite author. I own at least one copy of all 55 of her novels/short stories and have read them all -- even the four contemporary novels. I like her detective fiction as much as her Georgian and Regency romances. I Found Him Dead is one of the best of the det. fic., but my favorite is Behold! Here's Poison. It has one of the best characters ever in Randall Green. If you haven't read it, you should find a copy and do so. I think you'll like it.